Have you considered securing a Rome holiday package? It's really simple with Expedia, and you'll be able to buy some nice meals or presents for your friends back home with the money you save. Smart vacationers who secure a package deal on Expedia can save as much as $200*. Select from more than 400 partner airlines and 321 000 worldwide properties on our extensive database of flights and lodgings. Fly with who you want, stay where you like — now that's the ideal holiday! If you have to change your holiday plans, we will honour your cancellation request on nearly all reservations with no extra fee. Getting ready to jet off on your Rome holiday? Haven't got a clue what sort of things to include in your travel schedule? No need to fret — we'll give you a few suggestions. When you're heading to Rome, checking out St. Peter's Basilica and Roman Forum is obligatory. These world-famous attractions have played an integral part in putting this city on the map, are they're bound to knock your socks off! You won't have to worry about a dull moment in this alluring city. The Pantheon and Piazza Navona will keep you on the go. The Arch of Constantine and Villa Borghese are a few more popular attractions that won't disappoint. Check out the unusual assortment of anthropological items on exhibition at Capitoline Museum. It's guaranteed to be a fun and educational excursion for the entire family! Travellers in this destination have a great range of options. Choose a comfortable vantage point and observe the world roll by at Piazza Venezia. If you're feeling talkative, this historic public space is also the perfect spot to hang out with fellow travellers and locals. Still got time on your hands? Find out when Sunday Mass is held at Basilica di Santa Maria Maggiore. When you're there, take a few minutes to bow your head and lose yourself in silent prayer. Are you ready to create some unforgettable memories? A trip away is the perfect time to embark on some fantastic new experiences. Check out the Rome things to do page for a full list of activities. 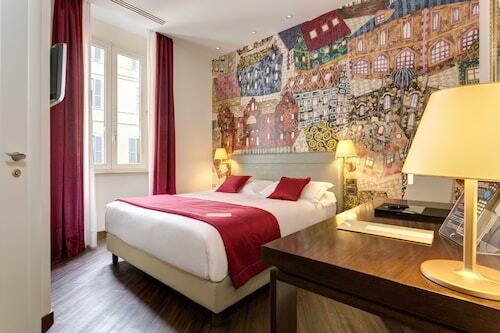 Find somewhere to lay your head before you start arranging all your cool adventures in Rome. Choose from the national capital's 2,806 Expedia accommodations and you'll be on your way to your next cheap holiday or luxury getaway. 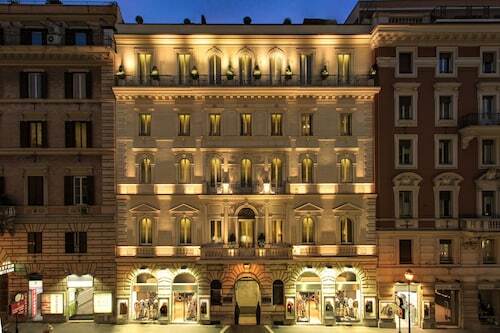 If you're the sort of person that can't fall asleep unless they're lying on high thread count sheets, why not nestle down in luxury at the Rocco Forte Hotel De Russie (Via del Babuino 9) or the Hassler Roma (Piazza Trinita Dei Monti 6)? Rather somewhere less expensive? Try the Manfredi Luxury Apartments (Palazzo Manfredi Via Labicana 125) and the Palazzo Scanderbeg (Piazza Scanderbeg 117). If you'd rather stay close to St. Peter's Basilica, the Amalia Vaticano Hotel and the Gran Meliá Rome Villa Agrippina -The Leading Hotels of the World are both within walking distance. If you plan to fly in, you'll most likely be kicking off your adventure at Ciampino Airport (CIA). Once you've collected your suitcase from baggage claim and wandered outside, central Rome will be 9 miles (14 km) away. Cast your eyes upon this famous monument, a combination of rich history and inspiring architecture that few buildings anywhere in the world can rival. This exquisite church offers some of Rome’s most notable architecture, as well as possessing a magnificent art collection that can be viewed by the public. In a city with an unequalled architectural heritage, Piazza San Pietro nevertheless makes its mark. See a collection of classic art worthy of a place in the Louvre, the Met or the Hermitage as you explore this illustrious museum. The Roman Forum is one of the world’s premier archaeological sites, giving visitors a feel for what life was like in the ancient and iconic Roman Empire. Comprising old papal buildings which still retain their original appearance, today, this are an outdoor meeting venue with open-air cafés and street entertainers. If you’re visiting the Colosseum and Roman Forum, stop by this square on the way. It has cafés and bars as well as museums and palaces just waiting to be explored. As you cross this historic bridge take in the elegance of it statues, gaze across the River Tiber and consider the pilgrims that walked over the bridge throughout the centuries. Visit this tiny island to see a charming Baroque church and several bridges that date back as far as the 1st century B.C. Learn about the battles of the Roman Empire, examine the detailed carvings or just admire the skills required to build this ancient symbol of victory. A prime people-watching spot, this famous square is a superb place to enjoy the sun and see some fantastic artwork and architecture. Wander down this elegant street to discover places of interest, including a centuries-old café, grand palaces and luxury fashion stores. Tour opulent apartments and ancient religious sites, stroll through narrow alleys and relax in the piazzas on the main street of Rome’s historic center. With pretty gardens and spectacular city views, it is of little surprise that these gardens have long been among the most desirable parts of Rome. Filled with designer boutiques and antique stores, this street is known as one of the best shopping areas in Rome’s historic center. Visit a museum dedicated to Italy’s light infantry corps and several historic religious sites on this prominent street in Rome’s city center. Walk along this historic street and find landmark buildings including a beautiful neoclassical exhibition hall and an exquisitely decorated 17th-century church. Running along the eastern side of Termini Central Station, this street is close to many of the city’s historic attractions and shopping areas. With a name that’s recognised all over the world, the Spanish Steps is another unforgettable landmark within the Italian capital, that every visitor should see. One of the most famous streets in Rome was the primary setting of Federico Fellini’s classic film La Dolce Vita. One of Rome's most famous landmarks, and one of the world's most notable monuments, no visitor to Rome should miss the opportunity to visit this iconic structure. Discover some of the oldest ruins in the city and see the place where Julius Caesar was murdered. Check out the largest and best preserved of Rome’s imperial forums and view the ancient architectural remnants of this once-powerful empire. Explore the different layers of history, admire the intricate artwork and frescos or just take in the sweeping views of Rome from this riverside fortress. Alongside its more obvious treasures, Rome has an abundance of beautiful water features. There is none more spectacular than the Trevi fountain. Tullamarine - Fiumicino - Leonardo da Vinci Intl. 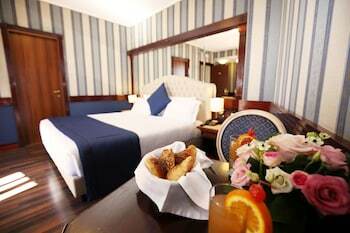 Located in Repubblica, this romantic hotel is within a 15-minute walk of Trevi Fountain and Roman Forum. Spanish Steps and Villa Borghese are also within 1 mi (2 km). Repubblica - Opera House Station is only a 5-minute walk and Barberini Station is 8 minutes. 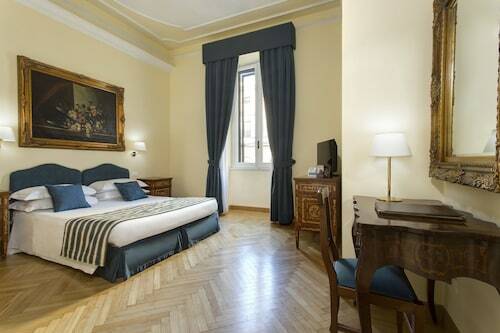 Located in Navona, this hotel is steps from Palazzo Montecitorio and Via del Corso. Pantheon and Trevi Fountain are also within 10 minutes. Barberini Station is 13 minutes by foot and Spagna Station is 13 minutes. 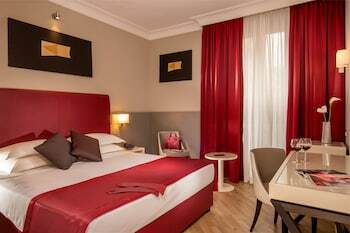 Prime location a few blocks from Rome's Termini train station, 100 meters from Piazza della Repubblica, 500 meters from Santa Maria Maggiore, and a 5-minute walk from the Opera House and Via Nazionale. 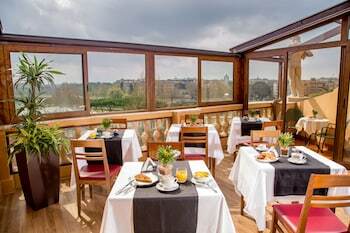 Located in Esquilino, this hotel is 1.9 mi (3 km) from Circus Maximus. Rome Termini Station is only a 2-minute walk and Castro Pretorio Station is 8 minutes. 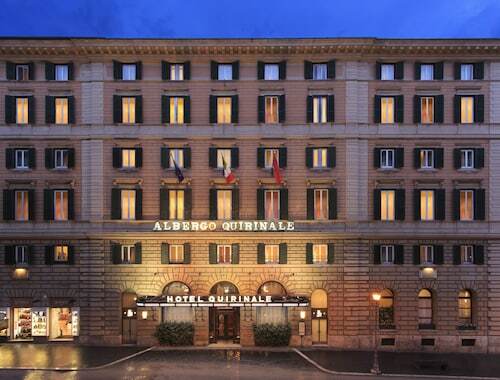 Located in Rome City Centre, this hotel is within a 10-minute walk of Baths of Diocletian, Basilica di Santa Maria Maggiore, and Palace of Expositions. Repubblica - Opera House Station is 6 minutes by foot and Cavour Station is 10 minutes. Sun., 16 Jun. - Wed., 28 Aug. Tue., 29 Oct. - Wed., 6 Nov. Tue., 5 Nov. - Wed., 20 Nov. Mon., 2 Sep. - Tue., 10 Sep. Sun., 8 Mar. - Sun., 15 Mar. Thu., 7 Nov. - Tue., 3 Dec.
Wed., 16 Oct. - Mon., 18 Nov. 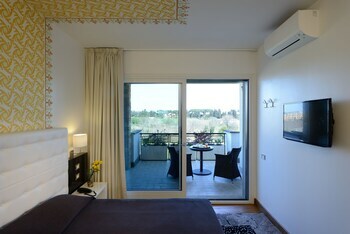 Looking for Flights, Hotels, Car Hire and Holiday Rentals in Rome?